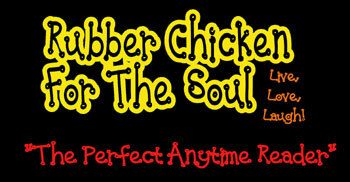 Rubber Chicken For The Soul - WHAT A WAY TO GO! THAT SMOKY FLAVOR -- A man's smoked body was discovered in the chimney of a barbecue restaurant. Workers found the body while tearing down the Farmers Market and Restaurant in El Paso, Texas. Police say the victim was identified as a Mexican national known only as Tony, about 19 years-old. The restaurant owner Juventino Hernandez said, "It's still possible that Tony might have been trying to burglarise the restaurant. He was small in stature, so he might have tried to get in through the chimney. I and another restaurant owner used to feed him for doing small, odd jobs." Witnesses described the body as "smoked." The barbecue was cooked with mesquite wood, witnesses said, which may have covered any odors. KILLER TOILET -- A falling portable toilet blew off a building and crushed a construction worker to death. Ramon Jose Rodriguez, 23, was working at a construction site north of Miami, Florida when a sudden gust of wind blew a portable toilet off the fourth floor of the building next to him. He died about an hour after the bizarre accident. A public spokesman said, "High winds evidently blew the metal toilet over the edge of the building. The victim didn't know what hit him." "It was a tragedy but it could have been worse," said a co-worker. "Fortunately, no one was using the toilet." BRUTAL BAPTISM -- A man beign baptized in waist-deep water was swept off balance by a wave and drowned. Police said John E. Blue, 37, of Boston was being baptuized by the Rev. Harold G. Branch in Lake Cochituate when the two toppled over into deeper water. "We were standing close together and I said 'I baptize you in the name of Jesus'... and when I said 'Holy Ghost', we fell apart," Branch recalled. "I didn't know what was going on because it happened so quickly." He had performed baptisms in the same spot before without problems. Sgt. Richard Cashman said both people couldn't swim and the Reverend ran for help after being able to make it to shore. "It could have been an omen if you believe in that kind of thing," said Cashman. A medical examiner ruled the death as an accidental drowning. MAN KILLED BY TWIN -- A man was killed in a traffic accident and in a greak coincidence, the dirver of the other car was his twin. Andrew Barrera, 22, was a passenger in a car driven by Jose Martinez, 24, in a remote area east of Livermore, California. According to the CHP, they were his by an automobile operated by Anthony Barrera, Andrew's twin brother. Martinez was reported in critical condition at Valley Memorial Hospital. Anthony Barrera was treated and released. SKYDIVING IRONY -- A beauty queen who joined a skydiving club to overcome her fear of heights has died in a parachuting accident. Tess Elliott, 23, was crowned Miss North Carolina USA the previous year and went on to be among 11 semifinalists in the Miss USA pageant in Wichita, Kansas. In a profile she submitted to the state pageant officials, she said, "To overcome my fear of heights, I learned to skydive." The skydiving club flew out of a small airstrip in near Farmville, North Carolina, and Elliot apparently choked to death after the lines from her main parachute and an auxiliary parachute became entangled. DEATH BY BEER KEG -- A man died when a beer keg he kept in his refrigerator exploded and struck him in the head. Clinton Richard Doan, 35, of Ketchum, Idaho, was in the garage putting his lunch, for the next day, into the refrigerator. According to chief sheriff's Deputy Gene Ramsey, the tragedy occurred when he opened the door and the bottom of the keg cracked, causing the keg to shoot upward "like a missile". Blaine County Sheriff Walt Fleming said that a faulty refrigerator could have caused extreme pressure to build up inside the keg. "The magnitude of the explosion was just tremendous," he said. BUNGLED BUNGEE -- A man taking a free bungee jump died because the balloon turned out to be 70-feet too low. William Brotherton, 20, took the plunge in Arvada, Colorado, from a tethered hot-air balloon over a field. He was taking a free jump in exchange for testing equipment. For Brotherton not to have hit the ground, the balloon needed to be 260 feet in the air; but it was hovering at 190 feet. The ground crew were shouting and trying to warn the pilot that it was too low. A report by the North American Bungee Association said that Bungee America wasn't insured or licensed by the state, ignored safety standards and should have been using radios for contact. BATON KILLS SPECTATOR -- A 61-year-old woman was at the wrong place at the wrong time and was killed in a freak accident by a baton. Jean Miles was a spectator watching a majorettes display in Weston-super-Mare, England, when a baton flew out-of-control and whacked her on the head. Officials said she died from the resulting injuries. BATHROOM BULL -- A woman who was waiting in a bathroom because she was too scared to watch a rodeo event was found and attacked by the bull anyway. The incident took place in Minot, North Dakota, where Barbara Deck was waiting while her husband watched the bull riding event. She had once watched a bull break the legs of its rider and so did not want to watch the event. According to testimony, the bull, after throwing its rider and chasing a rodeo clown out of the ring, went over the fences and down the hall before bursting into the bathroom. The animal pinned Barbara against a wall, injuring her left shoulder and arm, and kicked out a bathroom sink before the woman was rescued by cowboys, said her attorney, David Hogue. The indoor rodeo's 5 1/2-foot-high restraining fences should have been higher to contain the bull, a routine that even an Olympic steeplechase horse would have trouble duplicating," said District Judge Jon Kerian.